Rep. John Huffman during a floor session. Cannabis bills continued to make gains in the legislature this week with proposed legislation that would help 100 percent disabled veterans, medical marijuana cardholders and primary caregivers of cardholders, and industrial hemp growers. Senate Bill 1524 calls to allow permanently disabled veterans to forego annual medical exams required to retain their medical marijuana cards. The bill passed in the Senate and Rep. John Huffman [R-The Dalles] spoke in support of the bill. "I have a constituent in Crooked River Ranch, Stewart Steinberg, who is a Vietnam Veteran Services Officer," says Rep. Huffman. "Last year, on behalf of Stu, I worked with Oregon Health Authority to get a reduction in the annual fee for a Medical Marijuana Card for 100 percent disabled veterans." He says veterans were paying $200, but then the amount was reduced to $20 annually. "This year, Stu brought to my attention that 100 percent permanent and totally disabled veterans, according to their VA rating, are required to see a physician every year to get a statement for renewal of their Medical Marijuana Card," Huffman says. "This narrow and specific veteran population already see their VA physicians regularly because of the nature of their total disability; however, because of federal law their VA physician cannot attest to their need for marijuana use," Rep. Huffman explains. House Bill 4132 "specifies that marijuana retailer may not collect tax from consumer of marijuana item if consumer is registry identification cardholder or designated primary caregiver who is purchasing marijuana item for registry identification cardholder." Rep. Ken Helm [D-Washington County], says he sponsored the bill to protect Oregon Medical Marijuana Program (OMMP)-patient access to affordable medicine. "For cardholders, this bill would mean expanded access to their medicine at affordable prices. As more and more OMMP dispensaries transition to the retail market, it will be more difficult for cardholders to find places to purchase their medicine at the lower, tax-free price," Helms says. "For marijuana retailers, this bill would mean an expanded customer base. Cardholders who previously shopped exclusively at medical dispensaries in order to avoid the retail tax would become more apt to shop at retail stores." The bill is currently in the Joint Committee on Marijuana Regulation. Senate Bill 1598 would allow small growers to be exempt from having to obtain a land use compatibility statement, according to Sen. Ginny Burdick [D-Portland] who sponsored the bill. An amendment to the bill would provide an expungement for people convicted of a marijuana-related offense. "In other words, if someone had committed the crime before and now the activity is legal, it will help him or her expunge the previous conviction," says Burdick. "Let's say that somebody got convicted 10 years ago of possession of two ounces of marijuana and now it's legal to possess two ounces of marijuana. This will make it easier for them to get that previous conviction expunged." Sen. Burdick adds that SB 1598 will help regulate the medical marijuana market, which she says was previously a conduit for flow of marijuana into the black market. "Marijuana is used in hospice settings; it's used for pain; it's used for veterans who suffer from post traumatic stress disorder. We want to make sure as we make the transition to a legalized market that we don't leave the patients behind, that we take care of their needs, because many of them are not just medically vulnerable but low income." The Joint Committee On Marijuana Legalization is examining the bill. House Bill 4060, which clarifies and makes changes to the existing hemp farming regulations, passed in the House. Courtney Moran, an attorney with Earth Law in Portland, says the federal ban on industrial hemp production exists under the Controlled Substances Act because "marijuana is defined as all cannabis sativa; therefore, the DEA [Drug Enforcement Administration] and DOJ [Department of Justice] have interpreted that as to include industrial hemp." Moran notes that Oregon legalized industrial hemp back in 2009 with Senate Bill 676. Oregon's few industrial hemp farmers ran into issues with regulated field sizes and the facilities in which they could grow hemp. "The Oregon Department of Justice interpreted the statute to require farmers to direct seed into a field that was 2.5 acres or larger," she says. "That interpretation goes against what a lot of the farmers and I had interpreted the law to mean," she says. The bill clarifies that farmers may use clones, transplants and cuttings in addition to seeds, and would allow them to use greenhouses and other agriculture buildings to "be able to cultivate industrial hemp the way traditional farmers cultivate traditional crops," she says. Over the past production season 11 licensed hemp farmers maintained their licenses, nine farmers planted and five had a viable crop, according to Moran. Hemp farmers have also faced expensive testing fees because the Department of Agriculture has to take a two-pound sample to ensure that marijuana is not being grown. One farmer in Silverton was charged $850 for his testing and inspecting and another farmer in Grants Pass was charged $1,800, "which is very cost prohibitive for the farmers," she says. "This bill allows farmers to use the labs that are accredited by the Oregon Health Authority and licensed by the Oregon Liquor Control Commission to do that same testing." As the third week in the Oregon Legislature comes to an end, both the Senate and the House approved a major bill. Senate Bill 1532 would gradually raise the minimum wage over the next six years to $14.75 in Portland, $13.50 in Hood River, Wasco, Deschutes, Jackson and Josephine counties as well as the Willamette Valley, and $12.50 per hour in rural counties. After the Senate voted 16 to 12 in favor of the bill, Causa Executive Director Andrea Miller released a statement saying, "It can get lost after hours of testimony, but the basis for raising the wage is pretty simple: if you work full-time you should be paid enough to afford the basics. In the coming days, we'll be pushing legislators to recognize that all workers -- whether they work in the fields or in a factory, in Portland or in Pendleton -- need to be paid enough to support themselves and their families." Rob Sisk, president of Service Employees International Union (SEIU) 503, a union of 55,000 workers in care facilities and nonprofits, said in a statement, "While it is encouraging to see the Senate vote to raise the minimum wage, this proposal falls short of what we know workers need to support their families. While low-wage workers continue to struggle to make ends meet, the corporations that depend on them are receiving $1.7 billion in subsidies from taxpayers." 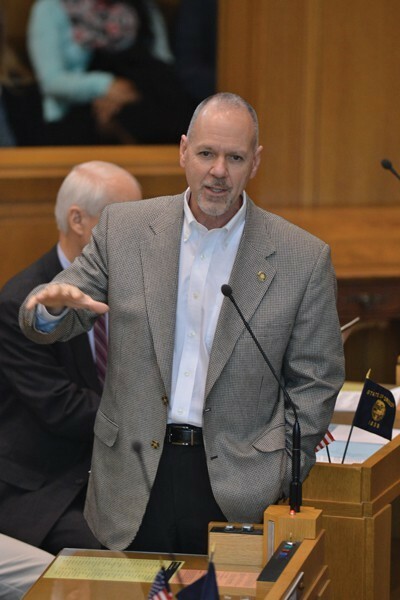 The Oregon Senate Republican Office announced that Senate Bill 1565-A passed in the Senate saying the bipartisan bill will help "to empower local governments to attract and retain small and family businesses." According to the Senate Committee on Finance and Revenue, the bill "allows county or city, by ordinance or resolution, to provide property tax exemption or deferral for newly constructed or installed industrial improvements with cost of initial investment of at least $1 million." "This bill is a practical step toward cutting red tape and restoring the ability of local governments to incentivize businesses to locate in rural areas, grow and create good jobs," said Senate Republican Leader Ted Ferrioli [R-John Day]. "Oregon already provides similar incentives to attract large businesses. Extending these incentives to apply to small and family businesses is a vote of confidence for the businesses that provide good, family-wage jobs in struggling communities," he said.